According to the Ghana Living Standards Survey 2005–2013, rural savannah* areas reduced poverty incidence** by over a third, from 43% to 27%. These areas also have the most people under the national poverty line. The poverty rate in Greater Accra is now just 0.5%, while urban coastal areas saw poverty rates increase. Ghana reduced poverty from 52% in 1992 to 24% by 2013. But self-employed people in agriculture gained the least from the economic boom in Ghana since 2005, accounting for almost two-thirds (63.9%) of those in poverty. In rural Ghana, agriculture and fishery accounts for 71% of employment. Poverty is generally less pronounced in cities than in rural areas. 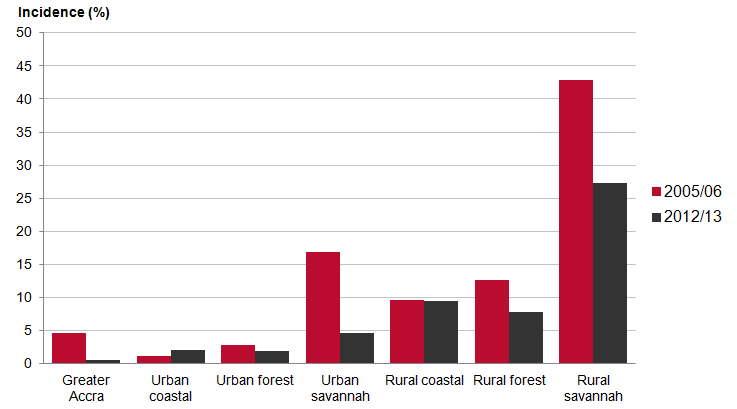 Rural savannah areas are home to 4.7 million people and have 1.3 million in extreme poverty. Greater Accra is home to 4 million people with 20,000 people in extreme poverty. Households headed by women*** experienced lower poverty rates (19%) than those headed by men (26%). Download the data in Excel or CSV format. * ‘Rural savannah’ refers to the agro-ecological zones of the three northern regions and parts of Volta and Brong Ahafo regions, with a combined population of 4.7 million people. **Based on national ‘extreme poverty’ line of US$1.10 per day (at market exchange rates).